Barlow Vineyards, owned and operated as a two-generation enterprise since 1994, is located on the Silverado Trail between Calistoga and St. Helena at the upper end of the Napa Valley. This is an area well know for producing intense red wine. We produce Cabernet Sauvignon, Merlot and Zinfandel grapes, from which we select fruit for our unfiltered wines which are all aged in French oak cooperage. The wines we produce are 100% varietal Cabernet Sauvignon, Merlot and Zinfandel. In addition we are now producing a blend of cabernet sauvignon and merlot "Barrouge". 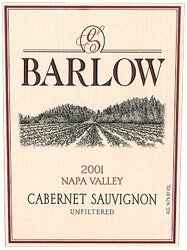 All grapes used in Barlow wines are grown at the estate. To join the wine club, visit www.barlowvineyards.com or call 707-548-8317. "REDS ONLY" wine club...2 or 6 bottles twice a year of each of our 4 red wines, pre-release.